CMA Fest 101: Everything you Need to Know about the HGTV Lodge! We've been receiving lots of questions from CMA Fest rookies so we've decided to create a new feature called "CMA Fest 101" to help newbies get the most from their first CMA Music Festival experience! Let us know what you are looking for and we'll consider including it in a future post! Tickets - You can not purchase tickets for HGTV Lodge Performances. They must be won through the CMA Music Festival Ultimate Fan Experiences Drawing. The link to this contest is usually posted on CMAFest.com during the last week in May. We will be sure to post it here as well! Ticket Pick Up - You may pick up the tickets you've won on level 2 of the Music City Center beginning Wednesday at 9 AM. Ticket pick up hours are 9 AM - 5 PM Wed-Sat and 9 AM - 2 PM Sun. You must pick up your tickets at least 2 hours prior to your event or you will forfeit them. Surprise Meet and Greets - It has been customary that a limited number of winners are randomly selected for a meet and greet when picking up their tickets at the Music City Center. It is worth noting that meet and greet selection hasn't appeared to be random, but rather first come first served. Pick up your tickets as early as possible for the best chance of winning a meet and greet! Get in Line Early - Having a ticket guarantees entry if you arrive on time, but you need to get in line early if you want to get near the stage! We suggest getting in line at least an hour prior to your show. Facebook CMA Fest Trade/Swap Groups - It is common for fans to overbook themselves with conflicting events and will be looking to trade for tickets to another event. Search facebook for CMA Fest Trade/Swap groups and keep an eye on the page for your tickets to come up, or make a post seeking tickets for the event you'd like to attend. Hopeful Lines - Don't fret if you didn't win a coveted ticket. There is still a chance to see your favorite performer at the HGTV Lodge! Simply get in the hopeful line early! The hopeful line doesn't guarantee entry, but you stand a good chance if you're near the front of the line. Official hopeful lines start to form about 30 minutes prior to the show, but fans start forming their own unofficial lines much earlier. If there is a show you really want to see walk around the area a few hours ahead of time to see if a line has started to form, and check back often. TV Screens - If all else fails, you can watch the performance on the large screen outside the HGTV Lodge. Not exactly the same as being inside, but still a great experience! The HGTV Lodge is an awesome experience! We will post the link where you will be able to enter for a chance to win tickets when the contest goes live! We wish you luck and hope you have a great time at the festival! 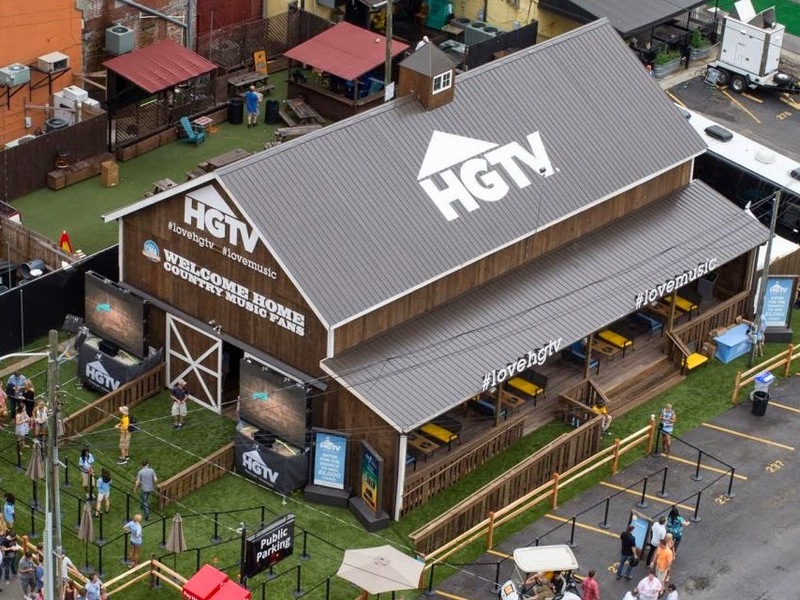 The HGTV Lodge debuted at the 2012 CMA Music Festival, hosting autograph signings and performances by a mix of up and coming and well known country music artists in an intimate venue. The little known, 2400 square-foot, barn-like structure was nestled in Fan Alley at the site that was occupied by "Tootsie's Honky Tonk Alley" in 2016. To attend events at the HGTV Lodge in 2012 you needed to enter for a chance to win at GACTV.com during the last week in May. Notable performers included: Dierks Bentley, Kip Moore, Kix Brooks, and Gary Allan. Signings included: Jake Owen, Little Big Town, Easton Corbin, Love and Theft, Scotty McCreery, Luke Bryan, and more! The HGTV Lodge returned in 2013 to much excitement as it was now a well known venue due to its success in 2012! The now popular venue hosted both new and established country music artists but focused more on performances rather than signings. The entry process was more controversial that year as you only needed to register for a free ticket through Eventbrite to attend (one event per day). However, the new ticketing method was poorly publicized, causing many people to miss the opportunity to register. If you were able to secure a ticket on Eventbrite you needed to pickup a wristband from the GAC Food Truck in "The Buckle" (lower Broadway) prior to the event which was a hassle. However, they also gave out surprise meet and greet wrist bands at random for many performances! The venue moved to its current location on 4th Ave S. (behind Honky Tonk Central) and introduced "Hopeful Lines" for those that did not have wristbands. These were standby lines that were allowed into the venue as space allowed after ticket holders had arrived. The addition of large screens outside the venue that live streamed the shows were great for those that couldn't make it inside. The 2013 HGTV Lodge featured performances from Brantley Gilbert, Brett Eldredge, David Nail, Phil Vassar, Chris Stapleton, Joe Nichols, and more. Appearances and signings by Thomas Rhett, Justin Moore, Florida Georgia Line, Little Big Town were featured as well! The HGTV Lodge changed its ticketing process again in 2014 and became part of what is now known as the CMA Music Festival's Ultimate Fan Experiences Drawing. To attend a HGTV Lodge event since 2014 you have needed to enter the drawing at FanFairX.com during the last week in May. Winners have been chosen at random and notified. Those who were selected needed to pick up their tickets at the Music City Center beginning on the Wednesday of festival week. Select winners were surprised randomly with meet and greet tickets again while picking up their tickets! Hopeful lines continued and were a great way to see the show if you didn't have a ticket. In 2014, the HGTV Lodge mainly focused on performances with Jana Kramer being the only signing. Featured performers included: Rascal Flatts, Dierks Bentley, Kip Moore, Frankie Ballard, Eric Paslay, Josh Turner, Dustin Lynch, Sara Evans, Brett Eldredge, Tyler Farr, Craig Morgan, Jon Pardi, and Love and Theft. In 2015, the the HGTV Lodge was remodeled and grew to 3500 square feet! The new space remained intimate but allowed for bigger name performers! Country superstars such as Lady Antebellum, Keith Urban, the Zac Brown Band, and Martina McBride have performed at the HGTV Lodge since the expansion! Other notable performances in 2015-16 include: Cole Swindell, Kelsea Ballerini, Josh Turner, Brothers Osborne, Darius Rucker, Dustin Lynch, Michael Ray, Lauren Alaina, Jake Owen, Frankie Ballard, Cassadee Pope, and Old Dominion. The ticketing process has remained the same since 2014 when it became part of the Ultimate Fan Experiences Drawing. This year looks to be another awesome experience as Keith Urban and Darius Rucker have already been announced to perform! The full lineup is usually released the last week in May! We will be sure to post it here!